There are eight legislative assembly constituency in Lakhimpur Kheri district for the 2017 Assembly elections. 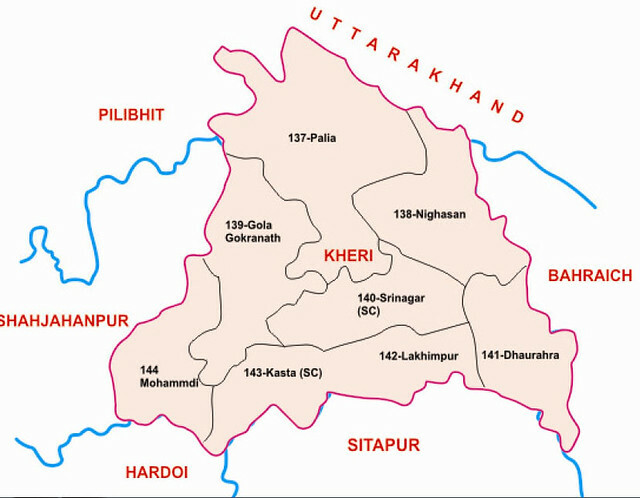 They are 141 Dhaurahra, 139 Gola Gokrannath, 143 Kasta, 142 Lakhimpur, 144 Mohammdi, 138 Nighasan, 137 Palia, 140 Sri Nagar. When Uttar Pradesh assembly election 2017 is getting ready to electios new Assembly, Lakhimpur Kheri is not anywhere behind in the election heat. Lakhimpur Kheri is the largest district in Uttar Pradesh, India, on the border with Nepal. Its administrative capital is the city of Lakhimpur. Lakhimpur Kheri district is a part of Lucknow division, with a total area of 7,680 square kilometres (2,970 sq mi). The national government designated Lakhimpur Kheri as a Minority Concentrated District on the basis of 2001 census data, which identifies it as requiring urgent aid to improve living standards and amenities.